Meet your neighbors Pastor Mike and Pastor Elaine of the Agape Church in La Harpe. Mike and Elaine have been church planters in Mexico and North Africa for the last 35 years. Pastor Mike was born in Cicero, Illinois and Pastor Elaine was born in Prineville, Oregon. Pastor Mike's parents are George and Elaine, both deceased, of the Cicero area. Pastor Elaine's parents Robert and Ruby Anderson, are deceased also. Mike has 2 brothers and Elaine has three. Mike and Elaine have been married for 40 years this year on April 8th. Mike graduated from Downers Grove South High School in 1968 and Elaine graduated from Klamath Falls High School in 1970. After 4 years of military service, Mike studied a career in Wild Life Biology at Oregon State University and later graduated from Christ for the Nations in Dallas, Texas with a degree in Theology. Elaine has a degree in Cosmetology. They are both ordained ministers through the Evangelical Free Baptist Church of Illinois and the Church on the Rock Ministries in New Albany, Indiana. Mike and Elaine have three boys. The oldest Joshua, 34 and his wife Adriana have two children; Keila and Kenneth and one on the way. Joshua is the CEO of a construction company in Grand Prairie, Texas. He is also an ordained minister and helps Pastor at a Hispanic Church. Next is Jared, 32 and his wife Brandy. They have two girls, Ivy Joelle and Jaela. Jared works for the Teamsters Union as a truck driver and Brandy owns her own cleaning business, Maid in Heaven. Jared is also an ordained minister. Youngest son Daniel, 27 and his wife Stephanie live in Carrollton, Texas. They have two boys, Luke and Liam. Daniel is a business executive with TXU or Texas Utilities. Stephanie has her Master's in Early Education and is a stay at home mom. Mike's hobbies include fishing, hunting and playing Pitch. He says "I'm not ready for the Senior Citizens group yet, but I'm getting there." Mike also speaks Spanish and Arabic and has used these as he has traveled extensively around the world. Elaine loves to read and she loves being a grandma. Pastor Mike and Pastor Elaine look forward to a long relationship with the people in La Harpe. Although the first time they were here was in 1978. They say "People here are so friendly." 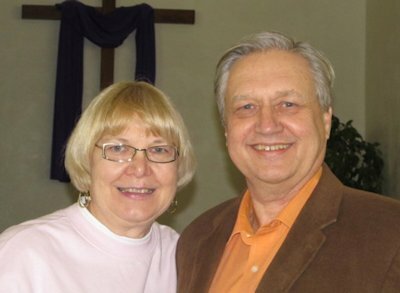 Pastor Mike and Pastor Elaine say they "enjoy ministering to all facets and religions. They love people and everyone is welcome."